Oldschool reverb with sounds so good they're scary. 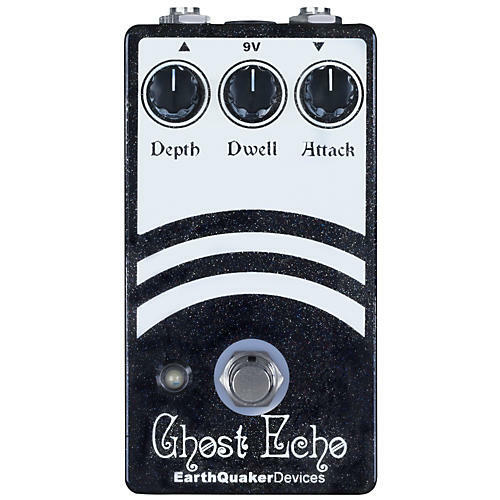 The Ghost Echo Reverb is designed to emulate a vintage reverb unit. It˜s capable of providing a little atmosphere all the way through to vast depths. The attack control sets the delay of the initial pick attack on the wet signal only. When playing staccato this registers as a slap back type echo hitting the reverb but when playing fluid lines it adds a massive depth and "fattens" up the sound. The dwell control is a fine tune function that enhances the decay. At first it may seem like it's not there but back it off and you'll miss it. The depth controls the intensity of the reverb. An, yes, it is true bypass! This is one ghost that should haunt you. Order today! Power: Any standard 9 volt DC power supply with a negative center 2.1mm barrel. No battery option.